The red wines from San Leonardo based in Trentino Alto-Adige are elegant and offer great value compared with the more expensive and highly-touted Bordeaux blends from Tuscany. I discovered some wonderful recent vintages of their San Leonardo Vigneti delle Dolomiti and loved their Carmenere. Tenuta San Leonardo is a hidden gem in the heart of Trentino Aldo-Adige, a region more known for whites than their reds. The history of this property dates back to the mid 18th century when it was purchased from the church by the Gresti family. The name originates from the marriage of Gemma de Gresti di San Leonardo to Tullo Guerrieri Gonzaga in 1890. By 1978 the first vines of Cabernet Sauvignon were planted, followed by other Bordeaux varieties such as Merlot, Cabernet Franc and Carmenere. In 1982, the flagship wine, San Leonardo Vigneti delle Dolomiti, was launched. With 42 hectares of vines planted in the estate of which 30 hectares are devoted to red grapes, this is a medium size winery still run by the Guerrieri Gonzaga family. The winery and vineyard went through a transformation in the 1970s, spearheaded by Marquis Carlo, and the entire winemaking facility was modernized with a brand new cellar that opened in 2002. 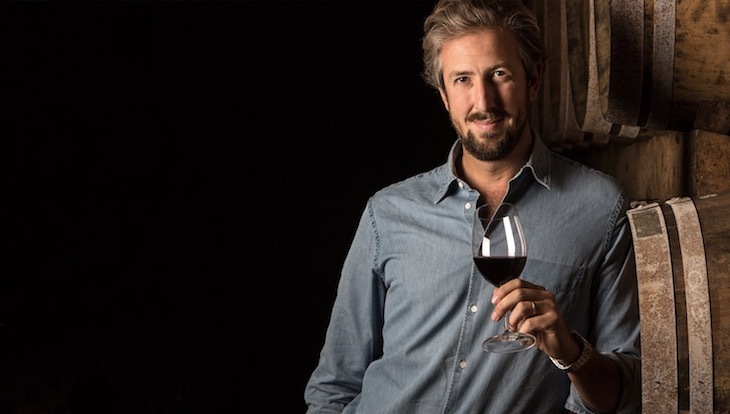 Now his son, Anselmo, is taking on more responsibility and traveling the world showing the wines of Tenuta San Leonardo. In May 2017, Anselmo Guerrieri Gonzaga was in Hong Kong showing both their whites and reds. I loved the elegance, finesse and general high quality of San Leonardo Vigneti delle Dolomiti as well as their 100% Carmenere wine, which is made in very small quantities. A fantastic, entry level red that is a blend of Cabernet Sauvignon, Melrot and Carmenere. A balanced, medium bodied red with supple, ripe tannins. Only 12.5% alcohol. Concrete vats used for aging are 60-80 hectoliters in size. The winery has been part of the Guerrieri Gonzaga family since the 18th century. There are 30 ha of red and 12 ha of whites producing 320,000 bottles total. The winery started modernizing in the 1970s. A plummy, dark chocolate-filled red with toasty, cedar notes. A full bodied (13.5% alcohol), voluptuous Merlot-based red on a specific vineyard site – only 15,000 bottles made. 20-25% new French barrels used here. This wine is beautifully harmonious with supple tannins and notes of cedar, aged cigars and dark berries. The tannins are velvety and supple with a lovely texture and long finish. This wine is always a blend of 60% Cabernet, 30% Carmenere and 10% Merlot and aged for 2 years in barriques. A beautiful symphony of flavors with cassis, cedar and tobacco notes. The tannins are beautifully handled with 13.5% alcohol. Still young and vibrant, but ready to enjoy now. The first vintage was in 1982. This wine is always a blend of 60% Cabernet, 30% Carmenere and 10% Merlot and aged for 2 years in barriques. A beautiful, full bodied expressive red with spicy flavors, herbs and blackberries. This wine is both elegant and rustic at the same time – it has guts and character. This Carmenere is medium bodied with only 13% alcohol and no vegetal flavors. Only 5,000 bottles of this wine is made per year. To read more tasting notes of Tenuta San Leonardo and other wines from Italy, click here.